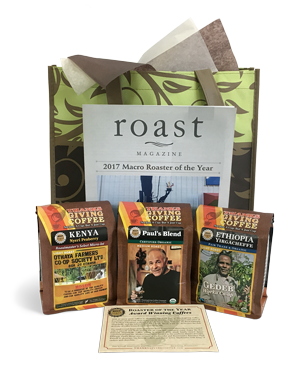 With so many great coffees to showcase our work here at Thanksgiving Coffee, Roastmater Jacob Long chose to present the Roaster of the Year judges with a few of our freshest coffees: the vibrant and rich Kenya Nyeri Peaberry, floral Ethiopia Yirgacheffe, and the beloved Paul’s Blend. 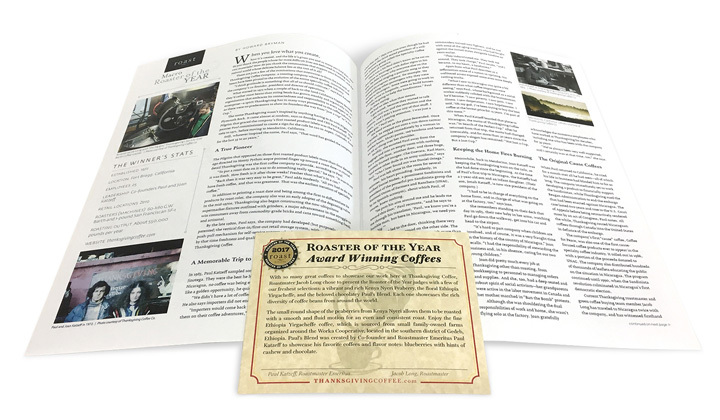 These three roasts won us the title of Roaster of the Year, during a blind tasting with Roast Magazine. Shop them together here to save! Deep and immaculately sweet. Rich notes of ripe cherry and golden raisin followed by a complex and lingering graham cracker finish. Ethiopia is known as the birthplace of Arabica coffee. Centuries of production and perfecting methods of preparation have produced brilliant results. 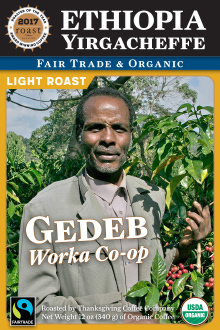 This fine Ethiopia Yirgacheffe coffee is sourced from family-owned farms organized around the Worka Cooperative located in the southern district of Gedeb, Ethiopia. A unique mouthfeel with hints of milk chocolate, ripe peach, and caramel. 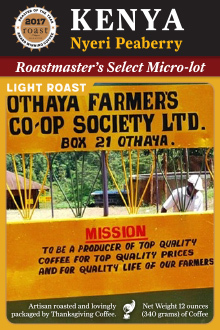 This Kenyan coffee is grown on the eastern slopes of Aberdares mountain ranges in Nyeri County, Kenya by the family owned farms of the Othaya Farmers Co-operative Society Limited (FCS). Established in 1956, FCS has more than 14,000 members who generally have half acre plots averaging 250 coffee trees. Co-founder and CEO Paul Katzeff created this blend to showcase his favorite coffees. Blueberry notes add to hints of cashew and chocolate. When you sip it, think blueberries and their sweet/sour notes will magically appear to please your palate.